Forget your laptop, your phone, and your gaming console. Your body is your smartest device. Your internal operating system keeps all your organs running, including the largest one: your skin. Think of skin as your beautiful waterproof case, keeping your internal structure and mechanisms safe from damage, while providing a protective barrier against the outside world. 1. Skin guards you from serious threats like UV rays, germs, harmful substances, abrasions, and weather. 2. Skin regulates and balances your body temperature, either by producing sweat to help cool the body down, or by increasing circulation to keep you warm. 3. Skin is a sensory organ, too; you use this covering to experience touch, temperature, and to send constant signals to the brain about what’s going on outside. Skin registers the ahhh from a massage, or the ouch from a paper cut. One way your skin communicates to the brain is through itching. It’s an important error message, alerting our brains to the presence of a potentially dangerous allergic reaction, dry or overheated conditions, or other dangers. Itching is a smart and useful response! … except when it isn’t. Often, itch can be less like an error message, and more like an annoying pop-up ad. Mosquito bites, minor abrasions, and other minor daily irritants can overstimulate the skin-to-brain communication. Then our scratching impulse starts up, which can cause us to damage and irritate our skin further, making itch worse. But this is where Blue Star Ointment comes in! Blue Star’s moisturizing and anti-itch actions manage these irritating pop-up ads. It protects from irritation, soothes the itch, and eases your impulse to scratch. So your system can focus on what’s really important: evading bears. Or, you know, watching an entire season of Scandal. Blue Star Ointment. Your skin is smart. Itching is dumb. Let’s get on with our lives. 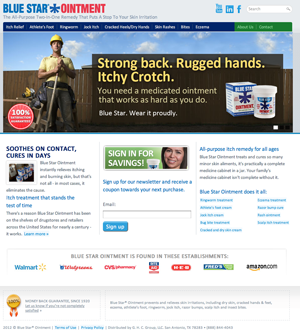 Blue Star® Ointment prevents and relieves skin irritations, including dry skin, cracked hands & feet, eczema, athtlete’s foot, ringworm, jock itch, razor bumps, scalp itch and insect bites.